For information about swimming at David Lloyd, please visit our Swimming & Spa page. We all know it’s so much easier to stay healthy when you’re really enjoying yourself. For most of us, this means updating our routine regularly to keep it fresh and challenging. And with so much on offer here, there’s always something new to try. 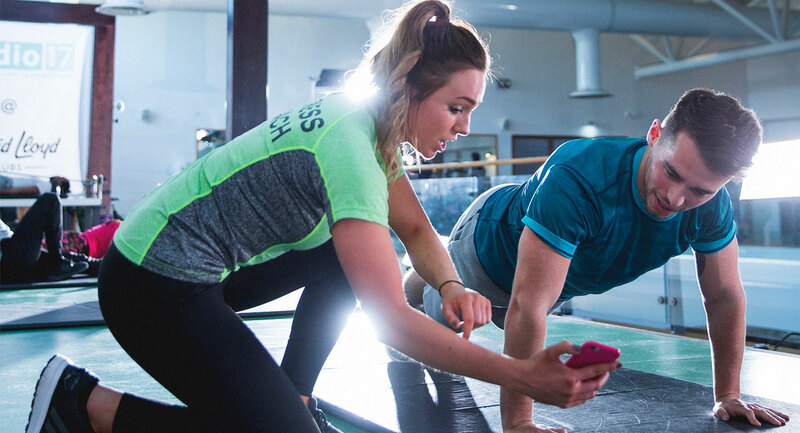 Our gyms have an unrivalled range of equipment, our group exercise classes are second-to-none, and our Personal Trainers are on hand to help you achieve your goals. Plus, when you join as a member of David Lloyd Clubs, you'll be enrolled onto our brilliant Kickstart programme. Kickstart is a tailor-made programme that involves a range of different sessions with our experts in the club. It's there to help every one of our members get off to a flying start in their new club. So, whether you're new to the gym and would like some guidance and help, or are a regular and want to get going straight away, your Kickstart sessions will suit you down to a tee. We’ve developed a brand new type of gym that integrates every possible kind of training in a really friendly, open-plan layout. It’s divided into specialised zones – we have areas for cardio, free weights, functional training and more. What’s more, we’ve got an amazing range of equipment and plenty of it too, so you'll never have to wait. Try our Woodway Curve treadmills, Octane laterals, Powermills, or Olympic lifting platforms. Or if functional training is more your thing, you'll love our SYNRGY360 areas which are essentially a fun playground to workout in. With so much choice, it’s really easy to keep your workout interesting and new. Exercising with other people is a great way to stay motivated. We’ve got an amazing range of group exercise classes, plus superb equipment and the best instructors who’ll help you get the most from every session. We have studios specifically designed for different types of exercise. The Mind & Body studios are great for numerous holistic classes like yoga and Pilates, and the Group Cycling studios host plenty of instructor-led and virtual cycling classes. Finally our High Impact studio covers everything from interval training, such as Les Mills GRIT™, BODYATTACK™ and BODYCOMBAT™, to circuit training and martial arts. Plus, you can now take your workout outdoors at selected clubs with out brand new class, Battlebox. Whatever workout you enjoy, we’ve got a class you’ll just love. Set in its own purpose-built studio, Blaze combines cardiovascular training with strength, boxing and martial arts skills in a unique HIIT session. Exclusive to David Lloyd and launching in clubs across the UK and Europe, Blaze will give you an intense workout like nothing you've experience before. Take a look at our amazing range of classes in our video. With so much choice we're sure we've got something you'll love. As well as amazing equipment and an unbeatable range of classes, our Personal Trainers are the best in the business. You’ll find our trainers are all very approachable and friendly, but they’re also really challenging. Whether they’re running functional training and gym-floor classes or providing one-to-one Personal Training, they’ll push you and keep you motivated. You’ll be amazed just how soon you see real results. There's nothing we love more than hearing how being a member of a David Lloyd Club has changed someone's life for the better. When Maureen joined our club in Manchester she was felt daunted about how she would fit in. But what she found was somewhere she felt comfortable, where she made friends and a place she truly belongs. "It's a friendly, exciting place to be"
"I can do it at my own level and nobody ever makes me feel foolish, or not part of the group"
"It's improved my life physically and mentally"
"When I think back I walked through those doors so scared, and now I walk through the doors and I think I'm part of this – it's great!" In some cities we have more than one David Lloyd Club. Take a look at those cities below and click the links to find out more information and which club will suit you most. Bristol - find out more. Edinburgh - find out more. Glasgow - find out more. Leicester - find out more. Liverpool - find out more. Manchester - find out more. Nottingham - find out more. Solihull - find out more. Southampton - find out more.